When Dr. Yellin delivers the Keynote Address at Reach Out and Read of Greater New York's Annual Meeting in New York City this morning, his talk will include a look at the emerging research on the importance of early exposure to language and enrichment on brain development in young children. That premise is the driving force behind Reach Out and Read, a national non-profit organization which began in 1989 in Boston, when a group of pediatricians at what is now Boston Medical Center began distributing books to their patients. By 2012 Reach Out and Read had almost 5,000 programs, including programs for military families, and distributed 6.5 million books to 4 million children, including more than one-third of American children living in poverty. 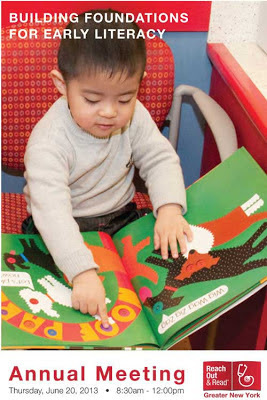 Pediatricians and pediatric clinics that participate in Reach Out and Read have unique access to young children and their parents. By using a three part approach, they can bring reading and books, and the language skills they build, to families that might not otherwise have access to this crucial building block of cognitive growth. First, children are exposed to books and reading in the waiting room, where volunteer readers read aloud to children waiting to be seen (and every parent knows that that can sometimes be a long wait). Next, the pediatrician or other health provider discusses with parents the importance of language development and how to build the language skills of their child in an age appropriate way. Finally, children leave their visit with a brand new book of their very own -- something which may be highly unusual in families dealing with poverty. An excellent discussion of the goals of Reach Out and Read can be found in a paper delivered a number of years ago by Perri Klass, M.D., Medical Director of Reach Out and Read. The evidence is clear that this program works.